the worst aoe damage because it take two cards for activate it, I prefer Hellfire. If you're a warlock and you don't have minions to combo this with, that's just your inability to play it. This card is definitely one of the more annoying ones. Heck it can be worst than the palading 2 combo board clear. Dang I have not seen this card in play. I might have to look up decks that are using this now. I feel like it could maaaaaaybe have a place in my fun Dreadsteed deck. Hit my Voidcaller with a Demonfuse, Demonfire, Demonheart, go face, then blow it up with this bad boy, Doomguard pops out with charge, and go face with him. Super rare situational but I guess the deck isn't really about winning anyway. It's about winning in amazing fashion that makes my enemy's jaws drop. what do u know about animations? The strongest AOE after equality. However, shadowflame is arguably more flexible than equality. 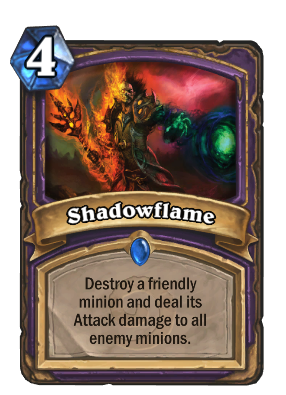 Below 10 health: Molten+Shadowflame (can be devastating for the opponent if you have double molten). When Jaraxxus: Hero power+Shadowflame (opponent generally floods the board after they face Lord Jaraxxus).